Good dental care includes dental floss. Even if you brush your teeth regularly and go for regular dental checkups, it is very important that you also floss regularly (preferably on a daily basis). Most of us will floss the day of or a couple days before a scheduled dentist appointment. But your dentist can tell that flossing isn’t part of your regular daily dental routine. Flossing is considered by many in the dental profession to be almost as vital as cleaning your teeth. It is an important factor in the upkeep of a healthy mouth and gums. Your toothbrush cannot reach and clean all areas of your teeth. Flossing helps get the hard to reach areas the toothbrush misses. If foods are left in those hard to reach areas between your teeth, they lead to the formation of plaque. Regular flossing will prevent this and ensure your teeth stay plaque-free. Plaque is a sticky substance made of bacteria, mucus, and food debris. It will darken your teeth, leaving them looking unattractive. Plaque is fairly easily removed, but over time, it turns into tartar, which can generally only be removed by a dentist. Tartar that is not removed contributes to tooth decay and cavities. If you want to have a nice white smile in the future, then keep plaque at bay by flossing every day. You’ll have healthy gums if you floss as well. Problems such as gingivitis can be avoided by flossing your teeth every day. This is because when food is left on the teeth for a long time it cause gum irritation. You can also keep bad breath to an absolute minimum by flossing daily. Rotting food stuck in your teeth will cause foul breath. Clean out that food by flossing daily. 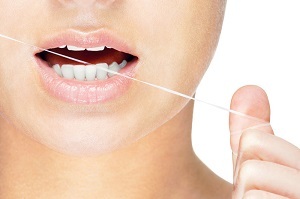 Flossing will help you keep your teeth longer by helping you to avoid decay and will also help prevent gum disease. There is also strong medical evidence to suggest a link between flossing and the prevention of heart disease. They say that people with periodontal disease are twice as likely to develop heart disease. The reason being, that diseased gums have high levels of bacteria, which will eventually leak into your bloodstream, causing inflammation in other parts of the body and perhaps ultimately cardiovascular problems. Results of other medical studies show that if people had certain disease causing bacteria in the mouth, then they were more likely to have blocked arteries in the neck (atherosclerosis), which can result in a stroke. Flossing daily combined with brushing twice a day will help ensure your dental health and well being. Just like it’s important to eat healthy foods and get regular exercise, it’s important to maintain your oral health. A healthy mouth will lead to a healthy you!